Frequency is the term that shows, usually over a quarter, a customer's average number of shopping visits per week. In other words, when we focus on Frequency, we are focusing on increasing the number of visits a customer makes in a quarter. Elementary, you might think. 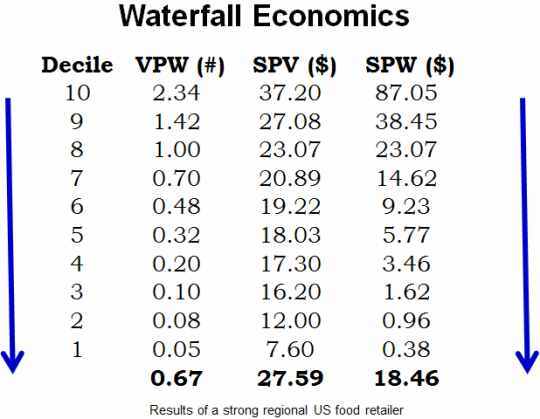 Waterfall Economics is a wonderfully descriptive term. It comes to life in the above table containing 6 months of data of a strong regional food retailer. Customers were sorted from highest to lowest spenders and then split equally into ten segments, or deciles, with the highest 10% spenders in Decile 10 (whose average spending per week was $87.05) and the lowest 10% in Decile 1 (whose average spending per week was $0.38). Incidentally, in case you are wondering about the data in Decile 10, those customers shopped an average of only 1.30 times during the whole 6-month period (ie, 0.05 Visits Per Week), spending an average of $7.60 per visit, which calculates to an average spend per week of $0.38 (0.05 x $7.60 = $0.38). They obviously comprised a lot of new customers who didn't stay long! ... decline in unison. As you move down from decile to decile they all fall ... just like a waterfall! The data of all food retailers and other high frequency retailers have a similar pattern but, obviously, not the identical numbers. You may have noticed something strange. If you start at the bottom (Decile 1) and work your way upward to the top (Decile 10), you see that the more a customer visits each week, the more she spends on each visit! This is completely counter-intuitive. It would be reasonable to assume that the more a customer visited your store, the less she would buy on each visit. Yet the opposite is the case. A colleague and I first noticed this over 20 years ago and it has never changed since, anywhere in the world. We don't know exactly why this occurs, but we hypothesize it's because the more often customers visit your store, the more she learns of the range and quality of what you sell and where things are placed and so, with increased knowledge and confidence in your quality, she increases her average spend per visit as she increases her visit frequency. Now, as both Frequency and Average Spend Per Visit rise in unison with a customer's weekly spending, the question arises: which of the two metrics is more important and deserves more focus? The preceding behavioral explanation suggests that increased Frequency drives increased Spending Per Visit. Data supports the same conclusion. The Frequency Table, above, is drawn from a year of sales data of a large, well-known US food retailer. Readings are shown of the bottom 20% (or quintile) of customers (ie, Deciles 1-2); the middle 20% (Deciles 5-6); and the top 20% (Deciles 9-10). In the center of the table three boxes show the average annual spending of customers of these three groups: the bottom, middle, and top quintiles. We see that as customers' annual spending rises, so does Spending Per Visit (vertical axis) and their Visits Per Week, ie, Frequency (horizontal axis), just as we saw in the Waterfall Economics table. From this Frequency table, one can calculate that as customers move from Quintile 1 to Quintile 3 and from Quintile 3 to Quintile 5, approx 75% of the sales gain of customers' weekly spending is correlates to an increase in Frequency and 25% correlates to the increase in the average basket size (SPV). 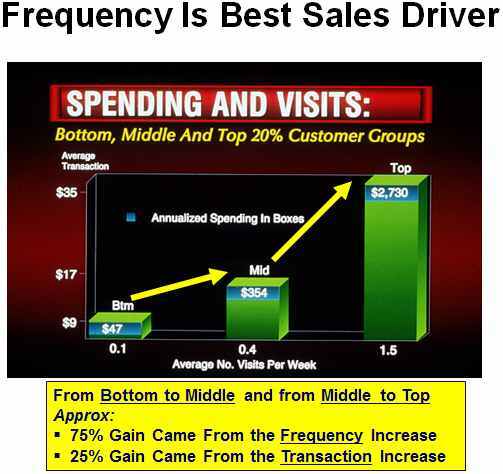 In other words, Frequency has triple the direct relationship impact on sales gains than Spending Per Visit, numerically reinforcing our earlier behavioral hypothesis. How Do You Increase Frequency? As stated at the outset, Frequency is simply the number of shopping visits divided by the number of weeks in the period. For example, 26 visits in a 13-week quarter is a Frequency of 2.0 Visits Per Week (VPW). To increase this Frequency a customer needs to shop more that 26 times in the quarter. For example, an increase to, say, 30 would move her VPW from 2.0 to 2.3. Any program that specifically aims at increasing the number of visits in a period is considered a Frequency Program. Many examples abound. For example, one retailer announced that, over the course of a quarter, members would receive a one-time, 5%-off gift certificate plus relevant coupons of increasing value as every cumulative $300 spending was recorded. The intent was to encourage customers to return frequently to earn the certificate and coupons. Another offers members a free newspaper of their choice and/or a free cup of coffee each day they shop. In addition, each transaction triggers an entry into their attractive monthly sweepstakes drawing. The more you shop, the more entries you have. Yet another program reminding customers to shop weekly offered quintuple points on purchases in rotating departments every Wednesday. Its intent was to own a part of its customers' minds by having customers automatically remember to visit each Wednesday rather than go to a competitor. Continuity Programs are a special type of Frequency Program. They require a customer to shop on a regular (usually weekly) basis over a designated number of weeks. For example, one retailer has, over many years, rewarded customers who spend $35 in one visit in 6 out of 8 weeks or 8 out of 10 weeks, etc, with the reward value increasing with the length of the program. These rewards have ranged from a gift certificate to a large, beautiful roasting dish. The retailer's intent was to reward regular higher-spending customers expecting that their weekly shopping habit would cement and expand their shopping relationship over time. Frequency programs are easy to design and administer, especially if you have a customer-identification system. And successful programs do convert customers into higher-spending customers. By giving more of your promotional programs a Frequency bias you increase the reasons why your customers should return ... and return and return. If you wish to build sales, remember: Focus on Frequency!